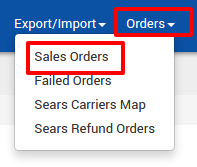 To fetch the new orders from Sears.com, click the Fetch Sears Orders button. The new orders if available are fetched from Sears.com and are listed on the page and a success message appears. If the new order is not created on Sears, then the relevant message appears on the page. To update the shipment information of the order on Sears.com, click the Sync BigCommerce Shipment button. Click the Close button to close the current page.